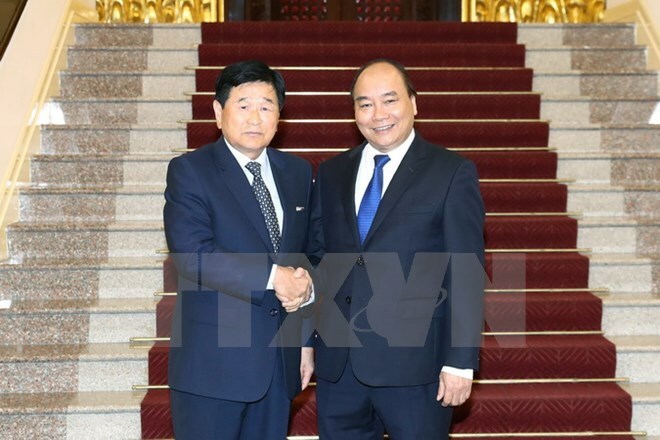 Hanoi (VNA) – Prime Minister Nguyen Xuan Phuc stated that the Vietnamese Government always provides all possible conditions for foreign investors, including those from the Republic of Korea (RoK), when hosting former Governor of the RoK’s Osan city Park Shin Won in Hanoi on August 29. He gave high estimations to Park’s dedicated efforts to promoting investment and cooperative activities with Vietnamese localities, especially central Quang Nam province, noting the efforts have positively helped spurring the strategic partnership between the RoK and Vietnam. The Government leader showed his delight to see the two countries’ growing cooperation and its important outcomes over the past 25 years and the presence and efficient operation of big RoK groups in Vietnam. He spoke highly of the cooperation between Quang Nam province and Osan city since they formed friendship and cooperative relations in 2004, wishing both would press ahead with cooperative projects and expand their collaboration in all fields. Park informed his host of the productive visit to Vietnam and said RoK businesses highly valued the Vietnamese Government’s determination to eliminate bottlenecks in business and production of businesses, including FDI ones.